This Vedic Sanskrit Mantra for getting good sleep is from the divine Mantra Collection of the Durgā Saptashatī, one of the most famous, popular and sacred of the Hindu religious texts, which is devotionally chanted by Millions of Hindus all over the world. Hence, this Mantra is believed to be most powerful and beneficial in getting sound and good sleep. This Mantra can be chanted by anyone who desires good and sound sleep and not just those suffering from insomnia and sleep related disorders. Good and sound sleep is in itself one of the most powerful healing remedies and is a must for those striving for good physical and mental health. A simple way of practicing this Mantra is to take a small cup of water, hold it in the right hand and chant the Durgā Saptashatī Mantra shown in the image 21 times in order to infuse the water in the cup with the potency of the Mantra. Then this water has to be consumed. This Sadhana has to be done just before going to bed at night. Then while in bed, the practitioner can keep doing the Mantra Japa and he will be fast asleep even before he realizes it. Sir can i infuse the water with the mantra and give it to my grandmother as she wont be able to do it. Yes. you can try the Mantra for your grandmother. The Mantra should be practiced only as mentioned in the article with full faith to get the full effect. The Mantra should not be chanted during the Monthly Cycle. Dear Sir, I was hospitalised and post surgery was unable to sleep even after taking sleeping tab. 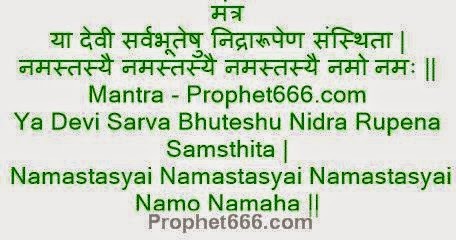 But i remembered you had sent this mantra and began to search for it and chanted it as per procedure. BEHOLD!!!! I had sound sleep for the next 5 hours, day after day i chanted the mantra and was able to sleep soundly. Thank you. THE MANTRA WORKS. JAI MAA DURGA DEVI!! !